I was looking at the Evo X suspension. The front seem the same as the VIII and IX. The rear shocks however look like ours without the lower fork, but with a regular lower mount that you slide onto the stud and bolt it to the car. It seems to me this would make the Evo X a simple bolt on affair. 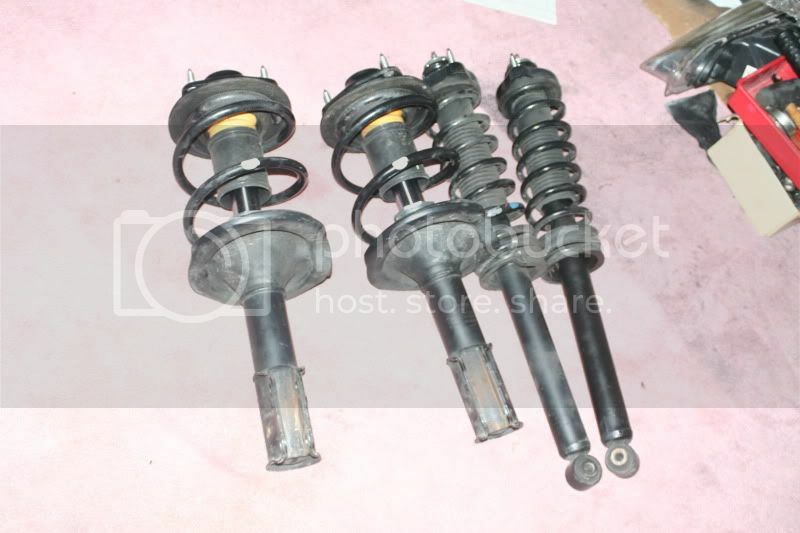 Or Evo 8-9 front and Evo 10 rear suspension set up. I had a 1g dsm friend ask me the same thing as he had acquired a set of Evo X stockers. Here's a pic of them, now I know for sure those rear springs are definitely much taller than the Evo 8s I have on my car. Let's see what the Veterans say. My friend said the rear springs are within a inch of the same height as his stock springs, to me that would mean there wouldn't be any difference in height then, correct? I had someone send me some measurements & the Evo X rears were ~2" taller than the Evo 8-9. If memory serves me right, the fronts were ~ the same. I can't gurantee these measurements though as I didn't measure the evo X's myself. However looking @ the X, you can see the car has a higher stance. So if the evo X rear suspension is 2" taller than the evo 8-9, then wouldn't work a bit better? I say this becuase when you install evo8-9 suspension you need to cut the front spring to level the car out. I always hate cutting springs so if the evo X suspension is taller in the rear, wouldn't it sit a bit more level without cutting the front springs? I think it may sit taller all around, but a set of lowering springs would fix that, or a set of coilovers for the evo X. Is my logic correct, or is the 2" too tall? It depends on what you want for your car. If the 4x4 look is what you want then you could bolt-on the Evo X setup & go offroading or have a nice winter setup. Keep in mind that the springs also have a stiffer rate than gvr4 springs so the car will sit really high. Even with lowering springs or coilovers? But at that point you'll be running an effective 2" drop on the suspension just to accomplish a stock-looking ride height. If you wanted to go any lower you'd have to worry about the struts bottoming out. Seems sketchy but if you can find a set cheep then I say go for it. What about using 8-9 rear springs on the 10 shock. If the shocks are the same length then couldn't we just use 8-9 rear springs? I would say the springs are longer because the lower perches are lower, so if lowering springs on evo X struts would cause bottoming out issues, then I would assume that evo 8-9 springs would do the same thing. Generated in 0.105 seconds in which 0.081 seconds were spent on a total of 14 queries. Turbo powered.